Command Night! / A day ahead! Info Around and around. Make time pass. 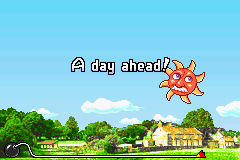 Night and Day is one of Jimmy T.'s microgames in WarioWare: Twisted! The player will control the sun and the moon. The game's purpose is to make time pass. The player must do so by tilting the system to the right. If they tilt it to the left the sun will get squished in its starting position, as it cannot move beyond that point backwards. If time's up and the player didn't make enough time pass, the game ends in a loss. 1st level difficulty: The player has to change the day to night. The Sun starts at the afternoon point, and when the moon locks into place, comets will shower down. 2nd level difficulty: Level 2 is Identical to level 1, but this time the sun starts at the morning point. 3rd level difficulty: The player has to make a day pass with the sun starting at the morning point and ending at the afternoon point the day after. When the sun locks into place a bunch of balloons or a flock of white birds will fly up. Also, the music for Level 3 is slightly different, due to it being day instead of night. This page was last edited on September 26, 2018, at 20:45.